Intellectual property protections are essential to helping unlock American innovation. Patents and trademarks give entrepreneurs the confidence and security they need to invest in new R&D, new businesses, and new employees. That confidence and security translates into $5 trillion of economic output at year -- a 2012 Commerce Department study found that industries that rely most heavily on IP protections support 40 million U.S. jobs and more than one-third of GDP. In order to help create the conditions for economic growth, the Commerce Department is making the country’s IP laws work even better. As part of these efforts, U.S. Secretary of Commerce Penny Pritzker joined USPTO Deputy Director Michelle Lee and Commissioner for Patents Peggy Focarino today for a ceremony commemorating the 700,000th design patent. The patent was assigned to LeapFrog Enterprises, Inc. for the design of “Leapster Explorer,” a hand-held learning and play device for 4-to-9-year-olds, featuring a touch screen and 3D graphics. 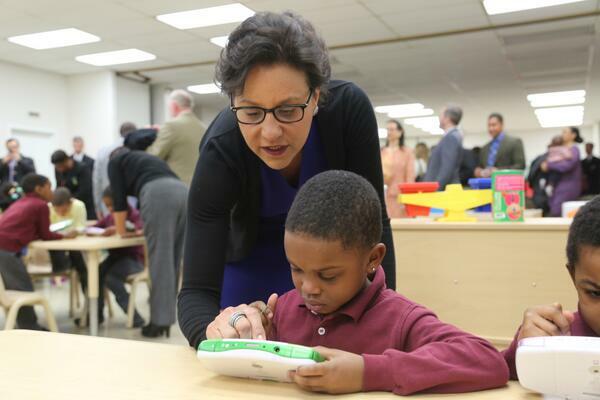 At the ceremony, which took place at the Langdon Education Campus in Washington, DC, Secretary Pritzker and Deputy Director Lee presented the patent to Leapfrog Senior Vice President and General Counsel Robert Lattuga. Every day, USPTO is awarding more utility and design patents to entrepreneurs and businesses to help them grow, innovate, and compete. Last year alone, USPTO issued 22,000 applications for design patents, an 8 percent increase over the previous year. A design consists of the visual, ornamental characteristics embodied in or applied to an article of manufacture. Applications in this area cover designs of computer equipment, cell phones and other handheld electronic devices, such as the Leapfrog Design Patent Number 700,000. The Obama Administration has been a strong supporter of efforts to make the patent system works more efficiently. President Obama recently announced a number of new executive actions to increase transparency in patent ownership, provide more training to patent examiners, and help inventors and small business owners who unexpectedly find themselves facing patent litigation. At today’s ceremony, USPTO also announced a new Intellectual Property patch for Girl Scouts in the National Capital Region (GSCNC). The new patch was developed as a joint project between the GSCNC and the USPTO, in collaboration with the Intellectual Property Owners Education Foundation (IPO). The patch is designed to support curriculum and activities that increase understanding of IP, especially as it relates to the fields of science, technology, engineering and math (STEM).